Father, my sister is reading this here. You know her, who she is... who You have made her to be... who You are MAKING US to be. Lord, You gave us a story. Long before today, You were working in us, drawing us to You, shaping us, breaking us, molding us again. Father, You know the desires of our hearts... make them to be Your desires for us, the things that we need the most to become the women You want us to be. And Father, thank You for the ministry of (in)RL. Please let it minister to each of us, open our hearts to community one more time, to reach across the table, the room, the building, to get to know the women in our neighborhoods, our churches, our communities. I pray Father, that even if they don't know or understand exactly what (in)RL is, that you will give them a curious spirit, and a little bit of BRAVE to sign up and come. To sign up and host. To join together and do something completely different to make sure that their story is told... and that we can listen and learn from her... because it's her HIStory. You alone created it for her. Amen. Derived from the social media acronym “IRL” or “in real life,” (in)RL is our annual conference that takes place the last weekend in April. In 2014, it will be the weekend of April 25th and 26th! It’s unique because instead of asking you to travel to us, we bring all the content to you. There’s a webcast to tune into and a day of real life meetups with other local (in)courage readers. In 2012, over 1,700 women participated. In 2013, there were over 6,000 women from more than 20 countries. Born out of two years spent listening to women in the comments here at (in)courage craving local, real life community, (in)RL is an invitation to share what we’ve learned about community and encourage women with stories and suggestions for connecting deeper in real life. (in)RL is the combination of outstanding online content that encourages, moves and inspires women as they watch in the comfort of their own homes and local meet-ups where small becomes the new big and women connect, in person, beyond the comment box. Are you curious yet?? In AR (where I lived last April) we had a great time!! A beautiful menagerie of women gathered together to learn about the good reasons to stay in community (HA - I just saw the irony of that in my own life... but that's another post!). I'll host with a friend here in my home this year... and whether it's 2 or 10 or 30 women that come... I'll be thrilled!! This year, we want to hear about your story! Everyone has one! Whether it's painful, profitable, or punishable... we all have one to tell. I love sharing how God has worked in my life, turning this self-centered, broken, bad girl into someone that is growing in His character and love... and He's still working on me.. my HIStory is not finished yet! 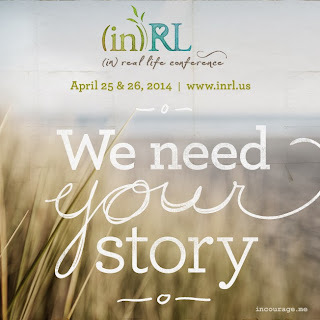 You can find out more about (in)RL here, and then go HERE to see if there's one in your area! If there is, then pray about attending. If you live in a heavily populated area, consider hosting another one! If no one is hosting, then pray about hosting one too - whether its in your home, a coffee house, a coffee shop, or a room at your church - THEY ALL WORK OUT GREAT! It's FREE to host, FREE to attend, and you have the freedom to structure it as you'd like to! Some women go all out with party favors and themes... some enjoy just letting everyone bring something to share... others like everyone to be able to order from the barista at the counter!! All you need to have is a computer, some wi-fi, and some speakers to be able to play the content that is shared. Join us?? Become a part of the (in)courage community!! Don't worry - you'll fit right in!! I promise! From the (in)courage site... "Our Heart"
More than anything, (in)courage is about relationships – with God and each other. We realize that our readers are in many different places in their journeys of faith. All of you are welcome. Our relationship with Jesus is the heart of who we are and all we do. It’s not about going to church or doing good things. And even if it were, that wouldn’t be enough because we’ve all messed up in life. We know what it’s like to have distance in a relationship because we’ve hurt someone else. And with God, there’s only one way to close that gap. Jesus came to earth and died on the cross to make that happen. We believe when we pray, “Yes, Jesus—you are my Savior. I ask for your forgiveness, receive your grace, and give all of my life to you” then our relationship with God is made right and we become His forever. Our relationship with God keeps growing all of our lives and we hope (in)courage will be part of that journey for you. The (in) actually represents being in Christ and then in community with each other…this is our heart and prayer for all of us.